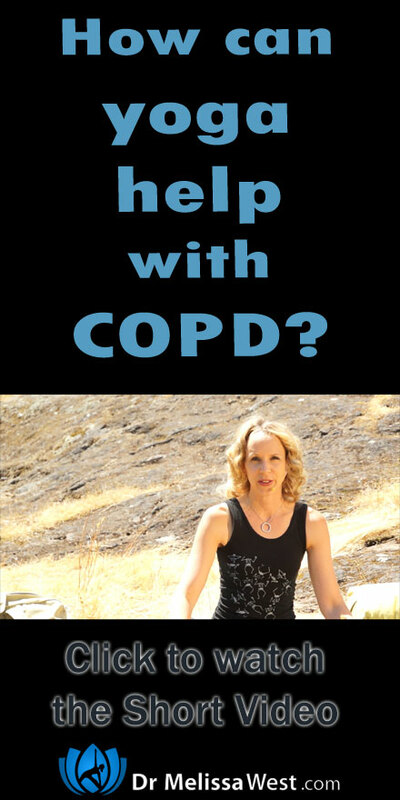 How can yoga help with COPD? Here’s a breath practice to help. 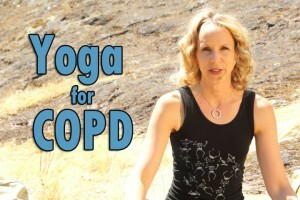 How can yoga help with COPD? First of all I am not a medical doctor, but a yoga instructor with a Ph.D. in communications and cultural studies with an interest in research, so it is most important to seek permission from your medical doctor first before engaging with any sort of exercise program if you have COPD. COPD stands for chronic obstructive pulmonary disease and refers to a systemic disease that causes difficulty breathing. 24 million Americans may have COPD which includes chronic bronchitis and emphysema. Patients with COPD have trouble pushing used air out of their lungs, making it difficult to take in healthy new air. A study done at the All India Institute of Medical Sciences, Department of Pulmonary Medicine and Sleep Disorders presented at CHEST in 2013, found that lung function, shortness of breath and inflammation all showed significant improvement in patients who completed 12 weeks of yoga training. The yoga included physical postures (asanas), breathing techniques (pranayama), cleansing techniques (kriyas) meditation, and a relaxation technique (shavasana). In short, yoga improved their lung function. Today I will show you how to do 3-part breath to strengthen your lungs and improve your lung capacity to help you release the air from your lungs and get a better breath of fresh air into your lungs.